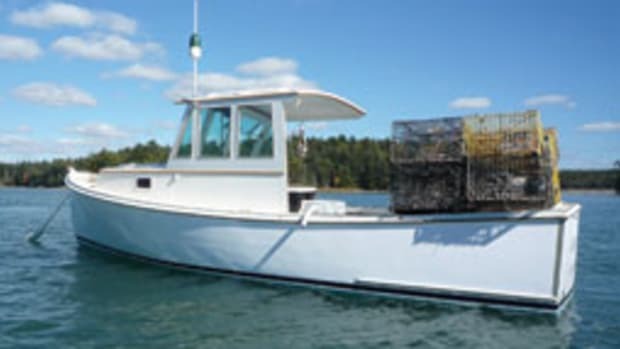 The Back Cove Downeast 37 looks at home off Maine’s coast. It’s the first place where the sun’s warm rays caress America each morning. Home to spruce-ringed lakes and granite islands; the world’s best lobsters and blueberries; majestic bald eagles and adorable Atlantic puffins; fields of wild lupine; and beaches banked by rosa rugosa … It’s Maine, of course, and with 17.5 million acres of forest abutting almost 3,500 miles of coastline, it’s no wonder this is also one of the world’s foremost boatbuilding locales. If you love boats (hah!) and you haven’t been to Maine, then you should finish reading this article and plan a trip immediately. No matter how many times we visit, we are stunned by the beauty of its harbors, dotted with boats of every type, their noses all pointed into the wind and not a one of them, it seems, ugly or ungainly. 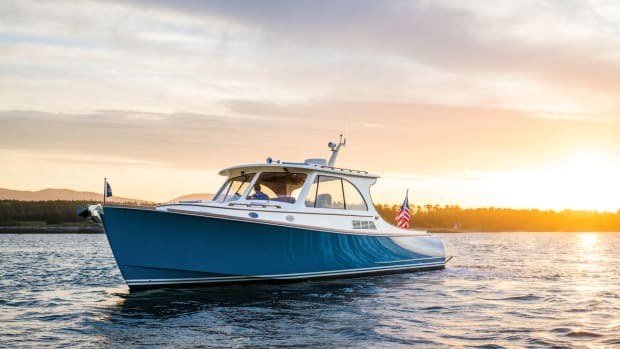 Soundings hit the road for a few days to visit some of the state’s boatbuilders, with the intention of giving you just a taste of Maine’s enormous building versatility. With yards ranging from Hodgdon (America’s oldest and one of its most technologically advanced) to Southport Boats (builders of resin-infused offshore fishing boats from 27 to 33 feet) to small-craft boatshops like Pulsifer Hampton, where a classic 22-footer is still built with traditional strip planking, Maine is a place where you could spend a year exploring shipyards and boatshops and still have more to see. 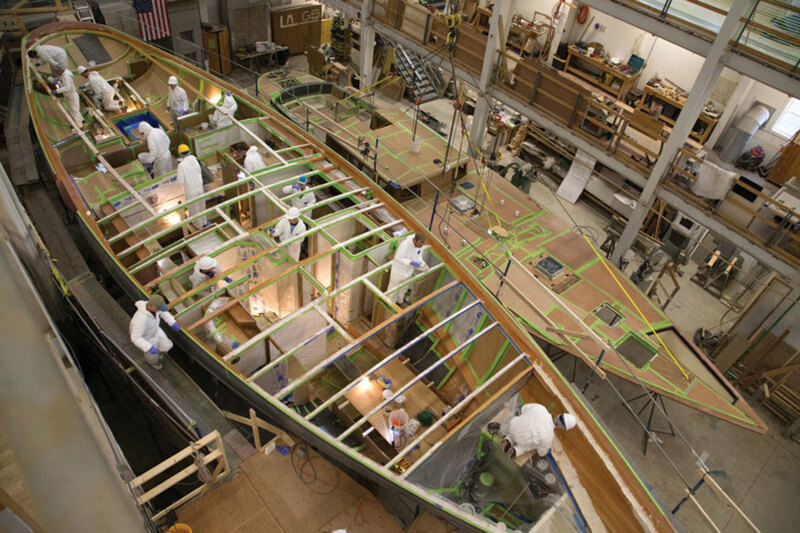 Here’s just a sliver of what’s happening right now in America’s boatbuilding mecca. — M.S. 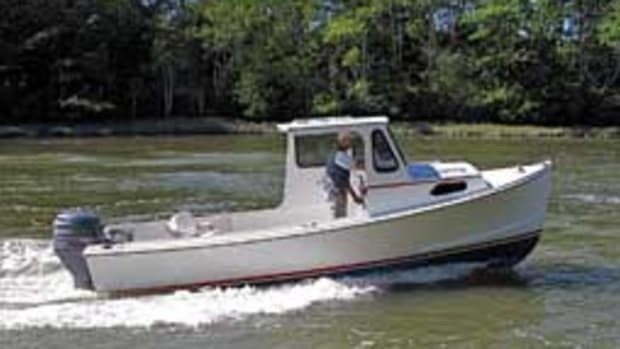 The Sabre 66 Dirigo is the builder’s flagship model. 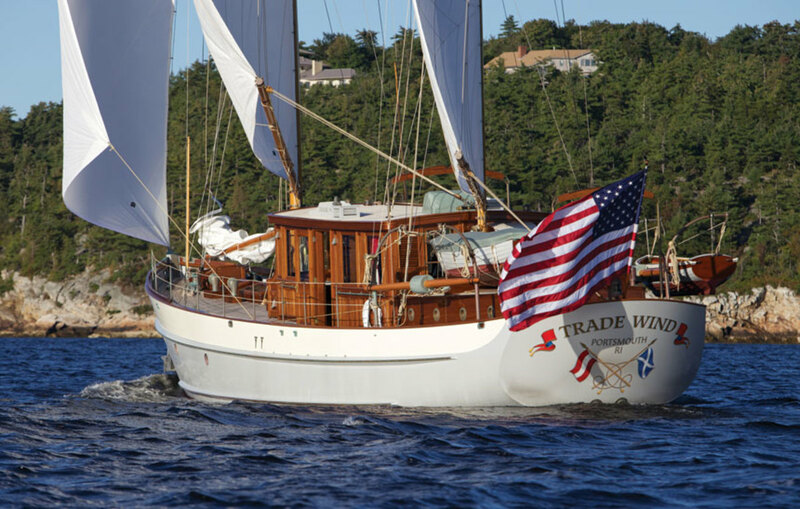 When we think of Maine, we think of wooden boats, but two of the Pine Tree State’s biggest success stories are Sabre Yachts and Back Cove Yachts, sister brands that build resin-infused Down East style yachts. 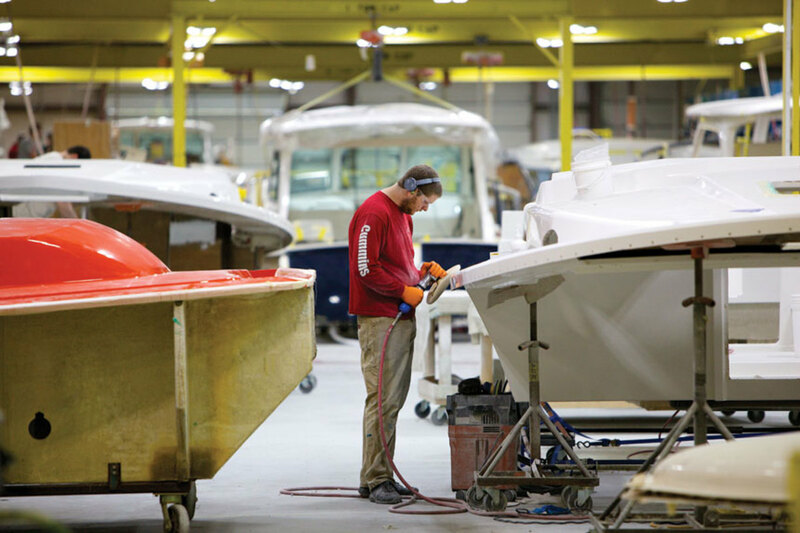 The two companies are producing more than 120 boats a year, which makes them, by far, the largest production builder of Down East boats. 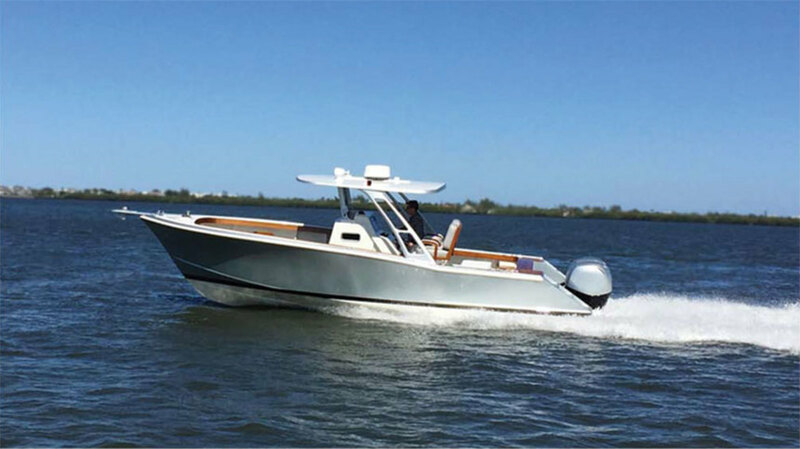 Sabres are semi-custom yachts powered by twin engine pod-drive systems that allow a cruise in the mid-20-knot range. 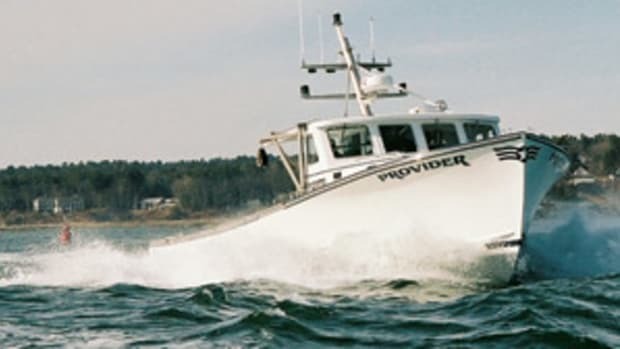 The company began as a sailboat builder in 1970 but introduced the Sabreline 36 Fast Trawler in 1989, and has since shipped 3,300 hulls. Raymond employs about 150 workers — this is a big, bright, well-organized factory — and as we walk the floor with Collins, it’s clear that in addition to the high-tech production, there is an old-school Maine boatbuilding ethos at work. The local residents are hardworking, good with their hands and committed to the area where, in many cases, generations of their families have lived and worked. High above the busy production floor, a sign hangs on the wall: “Each Sabre is a precision product that must meet the challenge of the high seas.” It’s a reminder that most of the workers at Sabre probably don’t need. Most Sabre employees have relatives or friends who have worked Maine’s rugged coastal waters, and they well know the life-and-death importance of a rock-solid build. It’s not in their DNA to take a shortcut or make it “good enough.” Sabre also employs a rigorous inspection process to ensure the highest standards in fit and finish. Nearly a third of Sabre’s production crew has been with the company for more than 10 years, and we met several employees on the floor who had worked there for much longer. 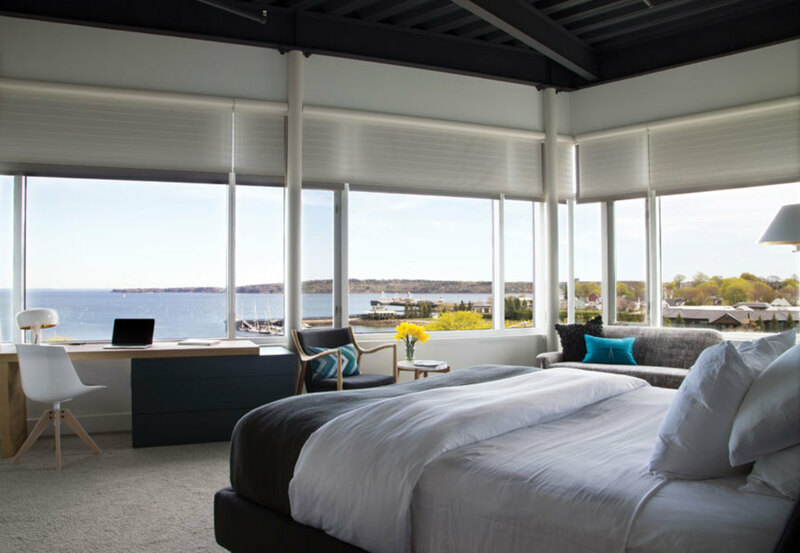 Cathy Thompson was installing blinds on a nearly finished build; she started with the company in 1982. Nancy Basselet, Sabre’s chief financial officer, has been with the builder since February 1977. But Butch Sawyer is currently Employee No. 1, as they call the current worker with the longest Sabre history: He has been with the company for 46 years. Still, Collins says that Sabre’s biggest challenge — and every Maine builder we spoke with, large or small, shared this issue — was a shortage of workers. Sabre and Back Cove would be building more boats if they had more workers; the demand is there. The Sabre 45 Salon Express is the company’s most recent offering. She has a saloon with a bright half-up galley and two staterooms with two full heads. Collins says she’s been popular, thanks to a utility space between the engine room and the guest stateroom. At the touch of a button, a settee moves, revealing steps down to a small cabin that could be used for stowing optional washer/dryers, additional freezers or wine chillers. The flagship of the Sabre line is the 66 Dirigo, with a length overall of 73 feet, 9 inches, and a beam of just over 18 feet. Kevin Burns, vice president of design and product development at Sabre and Back Cove, calls it “the highest expression of Sabre yet.” Introduced in late 2015, the luxurious Down East motoryacht allows a high degree of customization. It’s been a big success, with hull number 6 expected to launch a few weeks after our on-press date in late June. Sabre offers seven models: the 38 Salon Express, 42 Salon Express, 42 Fly Bridge, 45 Salon Express, 48 Salon Express, 48 Fly Bridge and 66 Dirigo. Collins hinted that the brand is considering a new build, “something to bridge the gap between the 48 and 66.” Base prices range from $630,000 for the Sabre 38 Salon Express to a “sail-away price” of $3.5 million for the 66 Dirigo. sabreyachts.com —M.S. A workman at Back Cove’s Rockland facility polishes the deck for the very first Back Cove 34O. Back Cove was founded in 2003 when a group of Sabre dealers requested a smaller Down East boat with an efficient single engine. 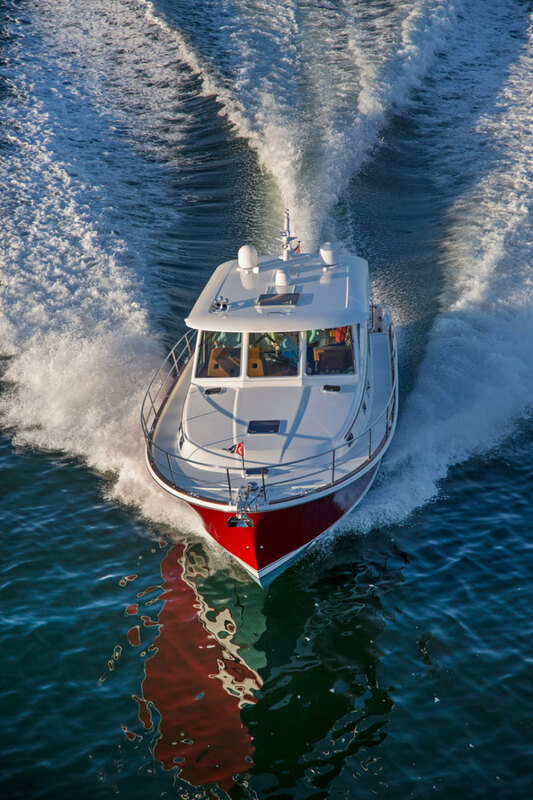 Today, Sabre’s highly successful sister company offers cruisers that range from 30 feet and 320-hp to 41 feet and 600-hp, with base prices from $280,000 to $610,000. 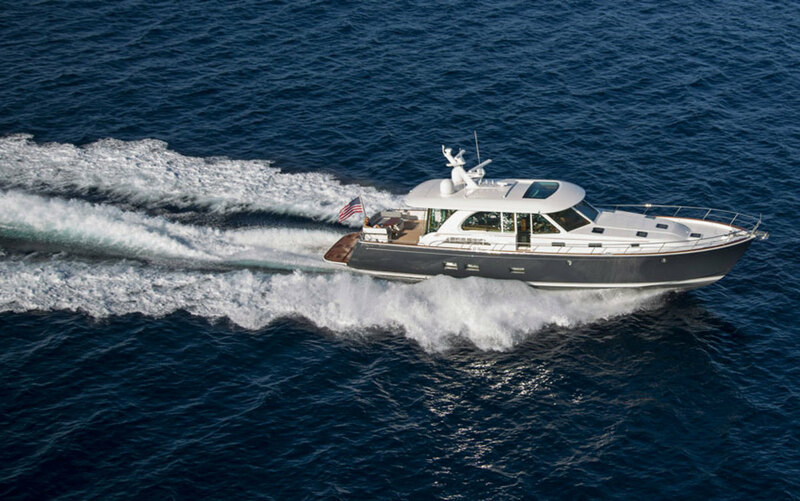 Awarded Best New Powerboat Under 35 Feet in the 2016 New For Newport competition, the Back Cove 32 is the company’s most recent build. 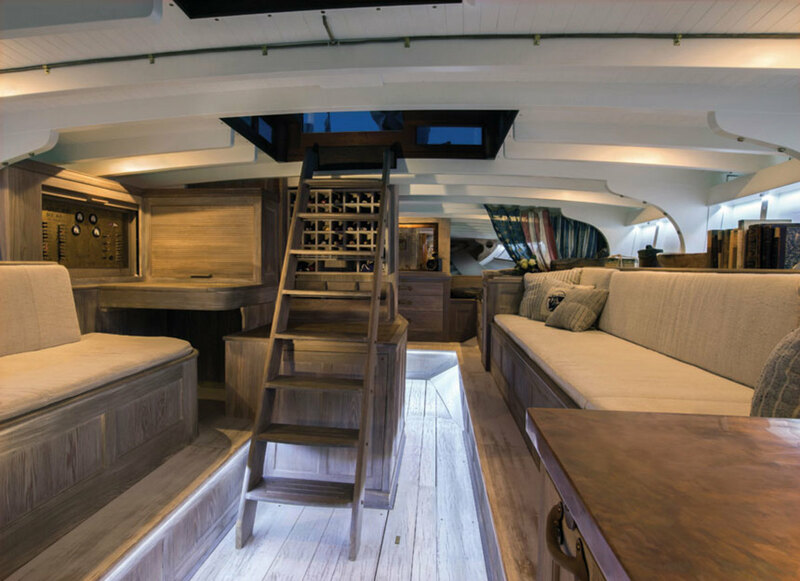 A single-level deck from the transom to the companionway opens the cockpit to the interior and galley, creating one seamless level that’s ideal for entertaining. Excellent sightlines also make the saloon level bright and keep skippers in touch with their surroundings. A settee is here for rainy afternoons with a good book. Down below, there’s an island berth with split head and shower compartments. 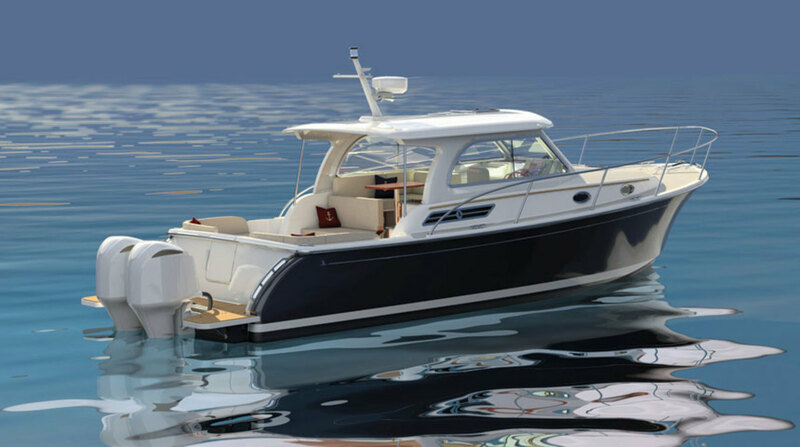 The Back Cove’s 34O will be the company’s first outboard design. 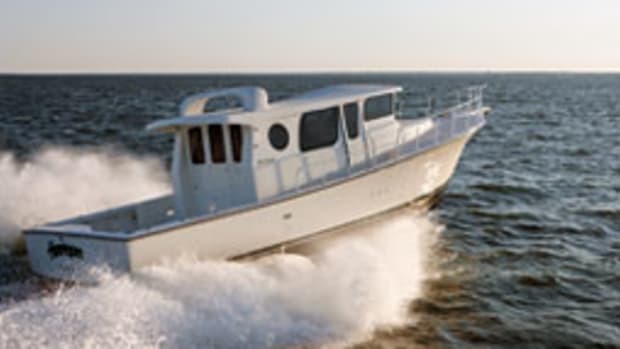 The beauty of the 32 is that it’s a low maintenance boat that gets the fuel economy of a trawler but is fast enough for weekend exploring in other ports. As with all Back Coves, there’s a minimum amount of teak. Take the boat out using the bow thrusters, go fast or slow as the schedule allows, bring it in and hose it off until next time. And it is easy on the eyes, with all the traditional beauty of a Down East design. More than 800 have been launched, and demand shows no sign of slowing. 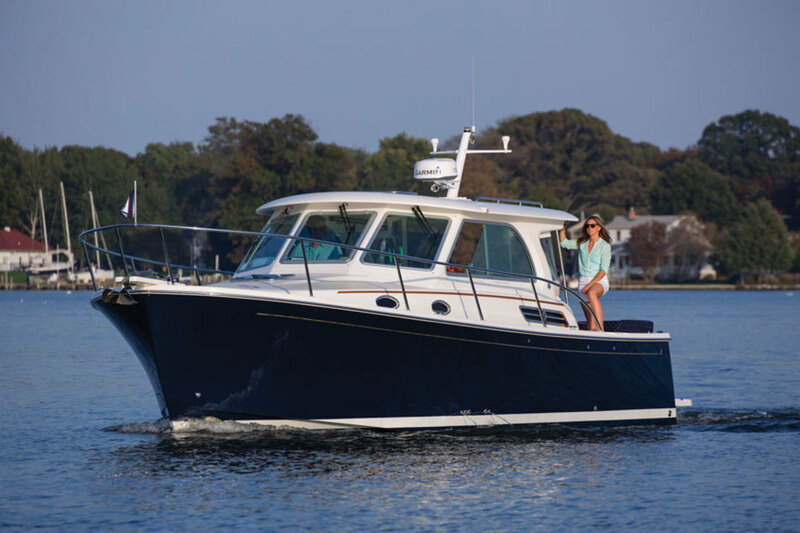 More than 800 Back Coves have been built and demand for the recent Back Cove 32 continues to be strong. Never content to rest on its laurels, Back Cove recently announced its first outboard-powered design, the 34O (that’s O as in outboard). It’s been a long road to the 34O. The company has been talking about launching an outboard product for 4-6 years and has drawn and scrapped several concept boats along the way. With the twin outboards up, its draft is 2 feet. The 34O has stowage where the diesel engines lived on the 32. There’s room for bikes, stand-up paddleboards and other water toys, a design element that should appeal to younger boaters. Back Cove sees the outboard model as the beginning of an expansion in what the yard offers, not a replacement. Burns drew a new hull for the 34O — one that’s 10 percent lighter than the 32’s, with a displacement of around 17,000 pounds. Standard power is 300-hp Yahamas; 350-hp Yahama or Suzuki motors are options. The 34O should cruise at 30 to 35 knots, with a top speed of 40 knots. Hull No. 1 is scheduled to launch in August. backcoveyachts.com —M.S. 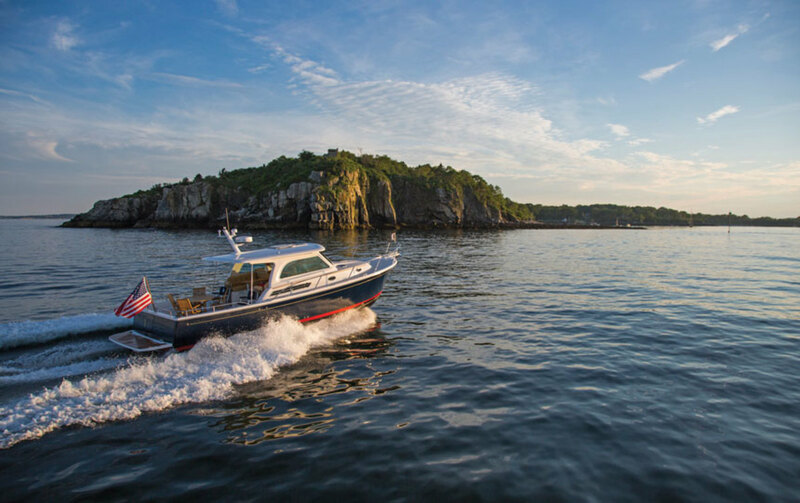 Maine Built Boats is a tax-exempt nonprofit organization established in 2005 to promote Maine as a worldwide leader in boatbuilding quality, craftsmanship and technologies. The organization meets about four times a year. Jon Johansen, publisher of Maine Coastal News, is president. Bentley Collins, Sabre and Back Cove’s vice president of sales and marketing, is the group’s vice president. The organization usually has a conference each November and it publishes an annual directory of its members who are “the best boat builders and service yards in the state.” The directory is free at boat shows, members’ yards and retail outlets throughout New England. Download a copy at mainebuiltboats.com —M.S. An Aage Nielsen sloop, a Bunker & Ellis lobster yacht, an L. Francis Herreshoff Rozinante, a Ralph Stanley lobster boat, a 45-foot Joel White motoryacht, a 1938 Alden motorsailer, a George Stadel Pilot Cutter, two lovely peapods and a half dozen other classic wooden boats are docked in the far corner of this picturesque harbor. All are in Bristol condition. It’s a museum-worthy collection, but this is no museum. This is Rockport Marine’s waterfront facility in Rockport, Maine, and boating season has begun. While the boatyard’s staff preps the vessels at the dock, a Concordia yawl on a trailer is swiftly driven down the steep, narrow road, past the yard’s offices, and adeptly backed up to a 76-foot Hinckley. The Concordia, Golden Eye, is one of 14 that the yard maintains, and has come from one of Rockport Marine’s six off-site storage buildings. It passed through one of the yard’s three paint bays and is now ready for launching. The fiberglass Hinckley, the largest one ever built by that yard, is being refitted with a wooden interior. Rockport Marine doesn’t build fiberglass boats, but to the workers here, any kind of woodworking is akin to walking. Inside the yard’s classic red shed, a 1941 50-ton sardine carrier is nearing rebirth as a cruising yacht, a Herreshoff 12½ has just received an inboard electric motor, and the 1955 40-foot Philip Rhodes-designed sloop Piera is in the last stages of bottom repair to address a severe case of asymmetrical hull deformation. 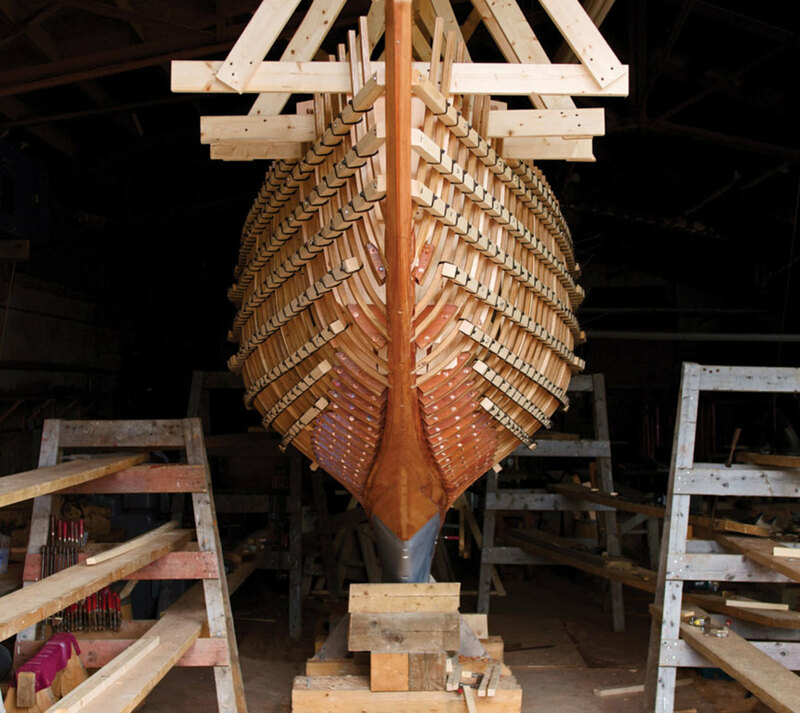 To correct Piera’s disfigurement, the yard’s crew secured the boat from stem to stern to the shed’s roof and walls, locking it in place while they removed its keel, stem, horn timber, a large number of its planks and even more of its frames. The plan is to replace each part and return the boat to its original design specifications. This 6 Metre yacht, Jill, which was rebuilt at Rockport Marine, demonstrates the yard’s wizardry with wood. But it’s now June 6, and although she is once again fully planked, the hull still needs caulking, fairing, sanding, priming and painting. The owner wants the boat back in the water for the Fourth of July, and with less than four weeks to go, Piera looks far from finished. The deadline, however, seems to leave Rockport Marine co-owner and operator Sam Temple unperturbed. Piera’s repair crew are having lunch behind the yard’s offices while other workers use the Travelift to launch a Buzzards Bay 25. Another employee motors a sailboat to the dock to have its mast stepped, and a mechanic installs a new battery in the Alden motorsailer. Nobody is rushing, and everyone seems to know exactly what needs to be done. Although the yard is quiet, everything runs like clockwork. It’s like an ant colony at work. Rockport Marine’s commitment to Bristol condition is clearly seen on Trade Wind’s foredeck. Maintaining, repairing and building wooden boats is something Rockport Marine has been doing for more than half a century. 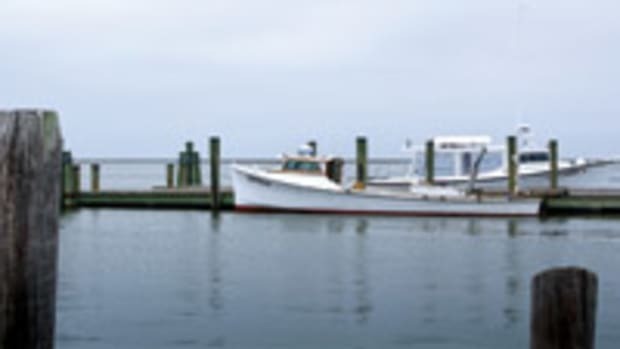 They know how to do it, which is why the work orders keep coming in and the boatyard’s crew continues to fulfill them. It’s June in Maine and the clients want their boats in the water. In this Downeast boatyard, full of classic wooden yachts, it’s just business as usual. rockportmarine.com —P.V.H. An employee works on the 94-foot Paragon Motor Yacht refit. Drew Lyman is on a roll. The president of Lyman-Morse is sitting at the mahogany table in the conference room at the company’s Thomaston, Maine, boatyard, and ideas are spilling out of his mouth faster than they can be recorded — although apparently, not too fast to be executed. 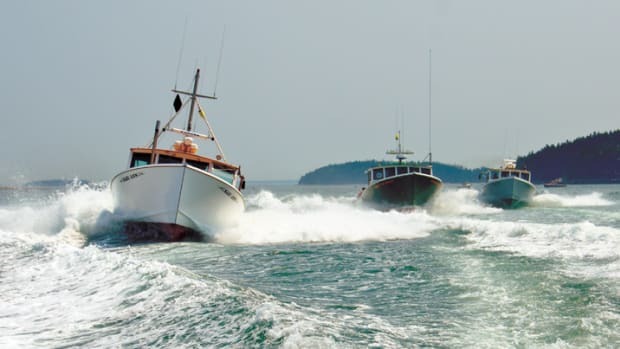 A decade after the recession that delivered a fatal blow to many boatbuilders in Maine and forced Lyman-Morse to reduce its staff from 205 to 68, the company has spent the past 10 years diversifying and strengthening its business, which now includes a staff of 140. Yacht brokerage offices were opened in Newport, Rhode Island, and Southwest Harbor, Maine; the Wayfarer Marine facility on Camden’s harbor was purchased; a restaurant was added to the Camden marina and leased to a contractor; the Camden Classics Cup sailing regatta was created; the metal fabrication and technologies divisions took on new marine, architectural and industrial clients; the composite shop built a steeple for a local church; and CNC routing and 3-D printing technologies were added at the Thomaston facility. Lyman-Morse craftsmen swarm all over Anna’s interior at the boatyard’s Thomaston facility. At the same time, new builds, refitting and maintenance continued apace. Since its founding in 1978, Lyman-Morse has built far north of 100 boats, and just finished the 65-foot Stephens Waring modern classic daysailer Anna. The yard also built the prototype for the new Bertram 35, which was based on C. Raymond Hunt’s Bertram 31, and last year launched Zenyatta, the ninth e33 daysailer/cruiser Lyman-Morse has constructed for eSailing Yachts. Lyman-Morse is now refitting a 94-foot Paragon Motor Yacht, finishing the restoration and repowering of the 1930 73-foot Eldridge-McInnis commuter yacht Scout, and preparing to refit a Swan 100. At the former Wayfarer Marine yard, now re-branded as a Lyman-Morse facility — an 88-foot Jongert and an 85-foot custom Bill Langan design are being worked on, and several new-build bid packages are under consideration for the Thomaston facility. And Lyman has more ideas. He wants to build a vibe in Camden. He’s talking dinghy races, junior sailing programs, parades of sail with cannons going off, stand-up paddleboard races and pop-up container shops. Did he mention the eau de vie distillery Lyman-Morse is planning to partner on in Camden? lymanmorse.com —P.V.H. Anna, a 65-foot classic daysailer was just launched from the Lyman-Morse yard. “When we got down to 68 employees, we were down to our core group, and we knew that if we lost any more it would be hard to come back,” Lyman-Morse president Drew Lyman said. With no new boatbuilding projects on the horizon, Lyman and his wife looked at turning an old pet store on Rockland’s Main Street — one Lyman had frequented as a child — into residential units. “There was garbage all over the basement,” Lyman said, “but my wife and I wanted to convert the upstairs spaces into lofts.” They brought the idea to Cabot Lyman, Drew’s father and the founder of Lyman-Morse, and he loved it. With no boats to be built, the yard’s crew could work on the building to get through lean times. Just as the Lymans were about to proceed, the yard landed a new-build order for a 63-foot Farr Yacht design. So, the boatyard crew went to work on what would become Kiwi Spirit and the hotel construction was turned over to a contractor. In the end, the old building had to be razed, but Lyman-Morse employees did some of the steelwork and shower pans, and a sizable chunk of the carpentry. 250 Main Hotel opened in 2016 with a bright, modern décor and hip atmosphere. The boutique hotel sports reclaimed and industrial décor and most of the 26 rooms have water views. 250mainhotel.com —P.V.H. 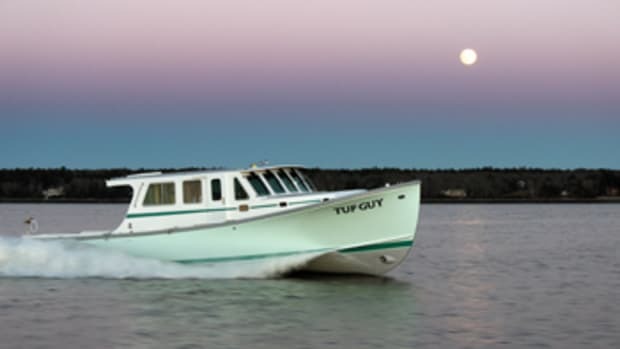 Todd French of French & Webb in Belfast, Maine, has been building and restoring spectacular boats for more than twenty years. Todd French has been running around. 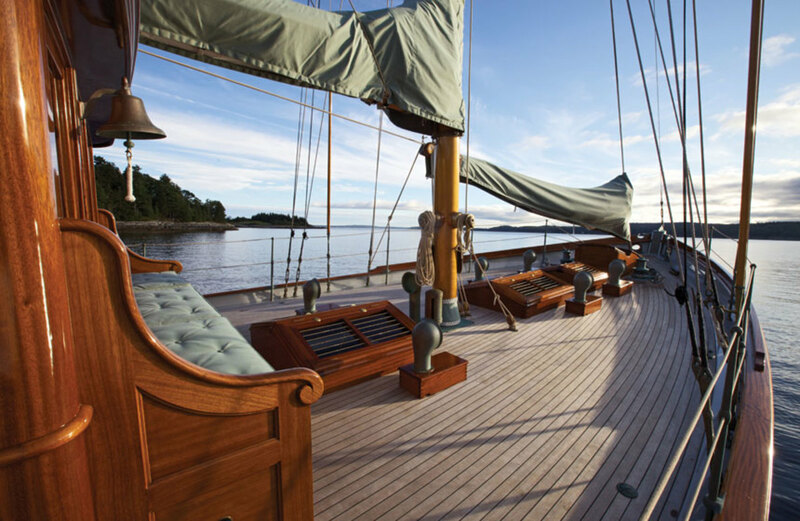 The principal of French & Webb in Belfast, Maine — known for its artisanal approach to boatbuilding, precision joinery and aesthetically pleasing yachts — has been cruising around Florida, but he wasn’t on vacation. He was showing off the French & Webb 30 Sport Commuter. The Mark Fitzgerald design with a composite hull (wood, Kevlar, carbon fiber and RFP) launched earlier this year. French spent the remainder of the winter in the Sunshine State at boat shows and yacht clubs, where the teak- and carbon-finished boat turned quite a few heads. 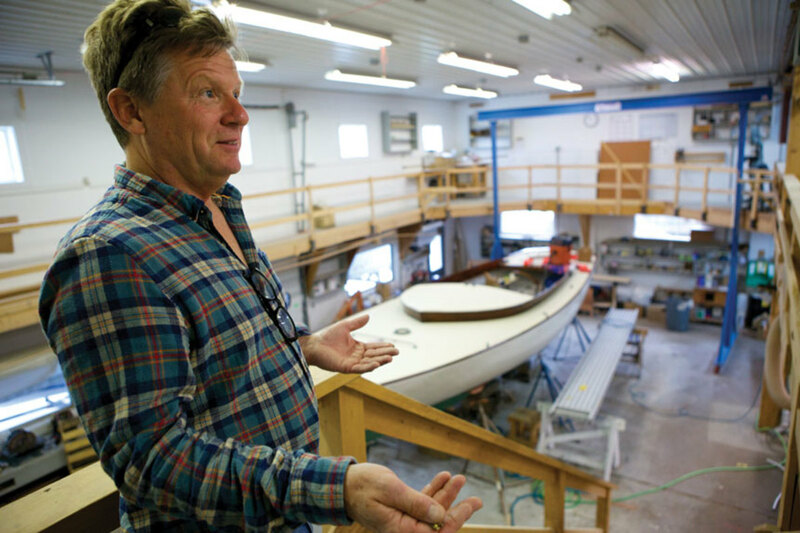 Turning heads is nothing new for the boatbuilder. 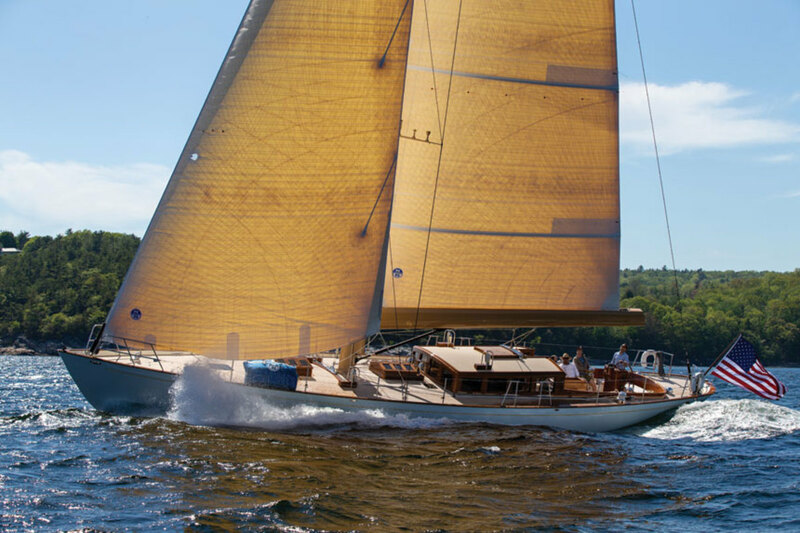 For the past 20 years, French & Webb has turned out new builds and restorations, probably none more spectacular than the restoration of Marilee, the 1926 Herreshoff New York Yacht Club 40. The 59-foot sloop needed her interior removed so she could, in essence, be completely rebuilt. She was severely misshapen, with her deck line and sheer having dropped more than 4 inches over time. Marilee hit the race circuit after her restoration. The refit was complicated because the owner wanted to race the boat in the summers, so the yard created an aggressive two-phase restoration, first concentrating on rebuilding the majority of the hull. The replacement of inadequate chainplates was amongst the items delayed until phase two, so French raced with the owner aboard Marilee that summer, but had some anxious moments knowing the boat’s rig was not as secure as he wanted. The French & Webb 30 Sport Commuter was designed by Mark Fitzgerald and launched in early 2018. The next winter, the yard spread the rig’s load with beefy bronze chainplates and replaced the pine deck with a teak one — in the process restoring the deck layout to the original configuration. At the owner’s request, French & Webb built an interior that paid homage to the boat’s history, but also was more open and modern. Using 140-year-old cypress logs recovered from a river in North Carolina, the yard built bulkheads, distressing the surfaces by beating them with chains and tools. The finished product was stunning. Much research also went into maintaining and restoring the boat’s exterior. Marilee was found to be the only Fighting 40 to have both a Marconi and a gaff rig drawn by Nathanael Herreshoff. Knowing this, the yard built both rigs, and today, Marilee can change out the rigs in less than one day. 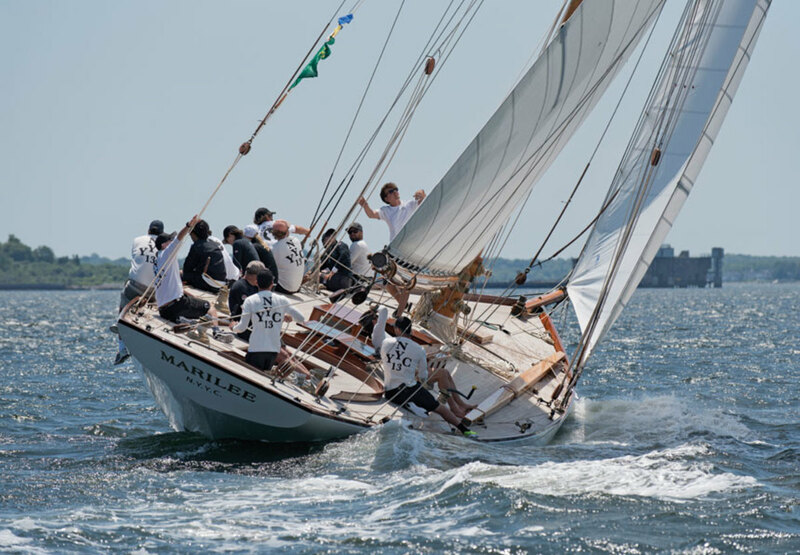 After the second refit phase, Marilee launched in time for the 2016 racing season and won best restoration awards at the Opera House Cup in Nantucket and the Newport Classic Yacht Regatta. Marilee’s open interior was built out of 140-year-old cypress logs recovered from a North Carolina river. French & Webb is now working with designer Chuck Paine on the Paine 15, an updated version of the Herreshoff 12½. She is slightly shorter, much lighter and built of modern materials and with a new underbody that makes her less tender. The yard has completed the first boat, and there are plans to build versions of other Paine designs as well. 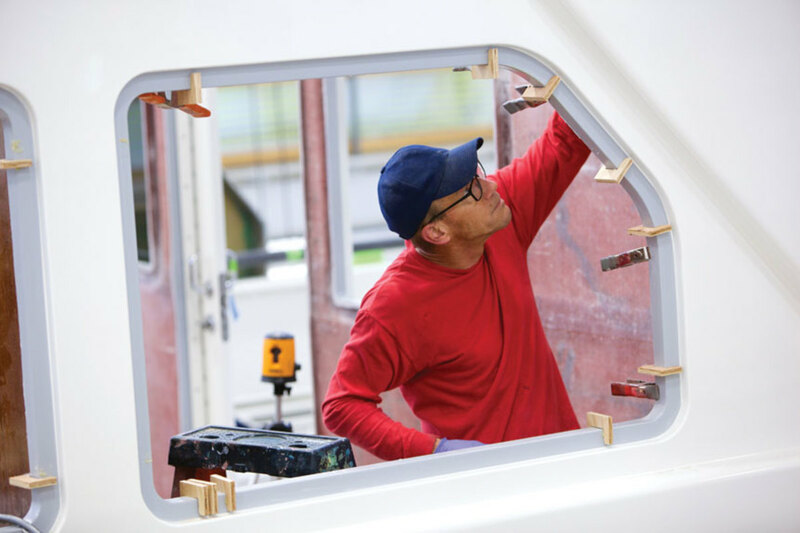 After French’s Florida trip to show off the 30 Sport Commuter, he flew to Hamburg, Germany, to oversee installation of a teak hot tub the shop had constructed for a 400-foot-plus superyacht being refitted at the Blohm+Voss shipyard. And while his crew is in California installing a deckhouse on a large yacht, he is promoting a film about the restoration of Marilee with nautical photographer Alison Langley. French is not sitting still. In that regard, innovation continues to be part of the French & Webb tradition. frenchwebb.com —P.V.H.